سواءً كنت مسافراً بغرض السياحة أو العمل, Tanoa Waterfront Hotel هو خيار عظيم للإقامة خلال زيارتك لاتوكا. يقع الفندق على بعد 0.1 km من مركز المدينة، ويؤمن الوصول إلى أهم مراكز المدينة. يوفر الفندق بفضل موقعة الجيد وصولاً سهلاً إلى أهم معالم المدينة.
. إن Tanoa Waterfront Hotel حريص على توفير الراحة للنزلاء، فلا يوفر الموظفون جهداً في تقديم أفضل الخدمات وضمان حسن الاستقبال. لضمان راحة ضيوفه، يقدم الفندق الخدمات التالية: أمن على مدار 24 ساعة, خدمة سيارات الأجرة, مجهز لذوي الإحتياجات الخاصة, مكتب الاستقبال على مدار الساعة, مرافق مخصصة لذوي الاحتياجات الخاصة . استمتع بوسائل الراحة الراقية في الغرف أثناء إقامتك هنا. بعض الغرف تتضمن تلفزيون بشاشة مسطحة, اتصال لاسلكي بالإنترنت, مكيف هواء, مكتب, شرفة/ تراس لمساعدتك على استعادة طاقتك بعد يوم طويل. إن مركز للياقة البدنية, حمام سباحة خارجي, تدليك, مسبح (للأطفال), بلياردو هو المكان الأمثل في الفندق للاسترخاء وتفريغ طاقتك بعد نهار طويل. اكتشف مزيجاً ساحراً من الخدمة الاحترافية والخيارات الواسعة من وسائل الراحة والمتعة في Tanoa Waterfront Hotel. Booked my parents for a night at Tanoa waterfront hotel as they had to attend a family function and was a bit worried because of they age (69 and 71) as they might give the staff's a bit of extra work reference to their in ability to do things....but I was absolutely happy of what they did to my parents...to staff of.Tanoa waterfront hotel VINAKA VAKALEVU for the excellent service and your professionalism in your work and help...they absolutely love the service...Thank you very much. My Wife & Daudgter stayed @ Tanoa Waterfront in Lautoka Fiji to sped the Last Christmas with Nanni . She has survived 3 stokes in California and took Nanni back to Fiji in November to Pass. I had gotten 2 rooms for my wife and her Mother with Healthcare workers to spend her last days before Christmas before they come back to USA. She had a 4 th stroke days after they flew back, hopping for the best . We stayed 10 days at the hotel for a tennis tournament. Rooms are cleaned daily, but only swept, not vacuumed. As a result we would occasionally have a huge clump of someones hair on our floor that came off the broom from somewhere else. The most disturbing item for all guests needing to clean some laundry was the hotel rate for using the in-house washer/dryer. The guest rate was $10USD (or equivalent Fiji rate) for each load which took only tokens purchased from the front desk. There is also a huge sugar mill factory in the vicinity that continuously belches black soot and it lands on the hotel and your patio when the wind directs it that way. Music was always played way too loud at bar, so conversation while drinking is impossible. Food at the hotel is marginal, so eat out. There is an excellent restaurant nearby. Despite the staff being always very nice, we will not return. Denarau is a far better option. There were three of us girls travelling together to Fiji staying at Tanoa Waterfront Hotel - Staffs were very friendly and very helpful. Hotel location were perfect for us and serves the purpose of our trip. Very close to the city with the food market etc etc. Love the live band on Thursday and Friday night except - wished the band was playing until 10pm instead of 9pm only. Love most things about the hotel except the sheets in room 122 & 120 were looking a bit tired :} Would definitely recommend to friends and families. Vinaka !!! Hotel is comfortable, but a little overpriced in my opinion. The noise at night is very disruptive as there is usually loud music playing. The morning breakfast spread is impressive and delicious. 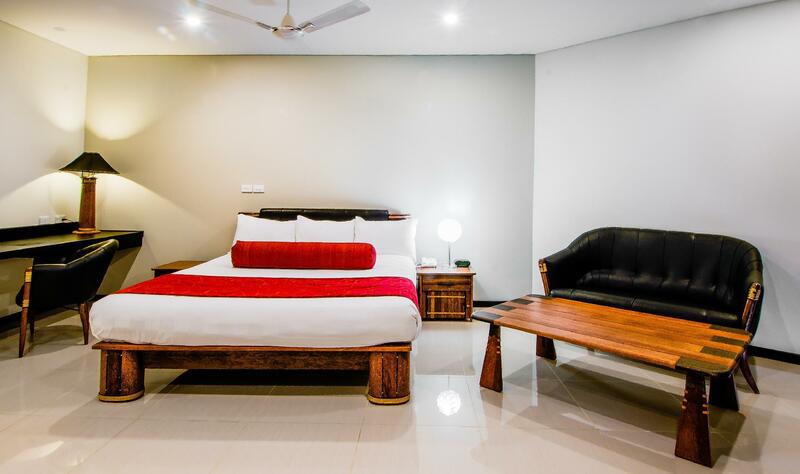 This is one of the only hotels in Lautoka so you really dont have much of a choice. Good and friendly staffs. Neat room and very clean. I love this place. Have stayed here few times. Awesome iced coffee and food and staff are super friendly. Highly recommended. Good place to stay if you are planning to take the Seabus ferry. Free breakfast, good room and comfortable bed. We stayed at Tanoa Waterfront for 4 nights....location was awesome....close to Lautoka Town and Tappoo City. We got a quite room and large comfortable beds which was very helpful when travelling with children. Breakfast was also very good with varieties. Kids had a great time in the swimming pool. We requested for more towels on the first day as there was 4 of us and only 2 towels provided but we never received it. We requested on the second day but never received. Also the night staff were not very friendly and too busy to greet or smile at the guests. Booked 6 nights and left after 3 without knewing if I will get the money back. 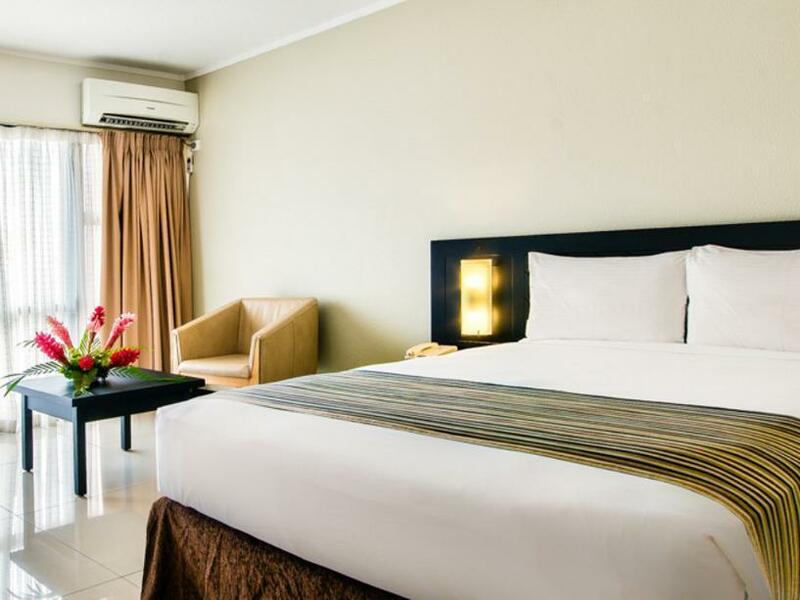 The hotel is more a cityhotel than a relaxing- holiday hotel. Breakfast ist poor and I think the fruits were out of a can. I did not try. Internet is expensive and there is no free wifi in public areas. Had problems with the safe twice and both times housekeeping (!!) helped with the back up code. Staff could be more friendly (specially the lady from reservation. I left her crying!) Most daytours are from Denarau, which is far and expensive by taxi. Some of my friends moved to the Tanoa Waterfront after they visited me there. It felt like home after six days. The staff were the friendliest most helpful hotel staff I have ever encountered in all my travels. I would certainly go back there, and would recommend it to anyone. Was pleasantly surprised with the position and quality of this hotel. Close to city centre, next to a park and the ocean. Good dining room and reasonably priced meals. Has a bar area open from 1500 with comfortable seating facing the waterfront. Rooms are reasonably spacious, good bedding and nice bathroom. This is not an expensive hotel, and is very good value for money. I was a bit disapointed with my stay at Tanoa. The staff did not appear to be that friendly with me and my husband. They stared at us which i found rude. The other thing i was angry about was at 8am i woke up to the sound of drilling. . Now on the night before i checked out; i had to use the laundry service. I used the washing machine and then i put my clothes in the dryer and the dryer didnt work. I had to lag my clothes all the way to the other side of the hotel to use another dryer. That delayed my time and by the time my clothes finished drying it was 11pm. Now i ordered a pizza from the restaurant at the hotel. The pizza tasted so plain and the base of the pizza was so hard. I had called up the restaurant to complain and they acted like i was a bad person for complaining; it was as if they never received a complaint before. They said they would replace the pizza and deliver it to my room in 15 minutes. I was waiting and hungry- the pizza came 40 minutes later. So i was quite disapointed with all of that. The flexibility No strict guidelines on visitors. My room was always cleaned daily with a smile. Staff were flexibile about my visitors coming and going sensitive to extended families (local family in Lautoka) I only wished there were more umbrellas around the pool. The cyclone had damaged many trees and there was only one umbrella making it hard for me to sit around the pool. I thought the prices for accommodation was great and I would reccommend this hotel and definately stay there again. This is a great little place with big comfortable rooms and very clean. It's in a quiet location at the edge of town, but easily walkable to shops and restaurants. It has a nice pool with the rooms overlooking it. There are guest washing machines available, which was great for us because we're travelling for 3 months. The staff actually took towels out of the dryer so that I could use it early in the morning. They also stored our luggage for us while we went off on a cruise. The restaurant is good and is open late. Would definitely recommend. We stayed here before and after our Blue Lagoon cruise to the Yasawas. They kept our luggage for us, which was a big help. They have guest washing machines on site and actually took some towels out of a machine so that I could use it in the early morning. The rooms are big and comfortable. The restaurant stays open late and serves good food at a reasonable price. Would definitely stay there again. 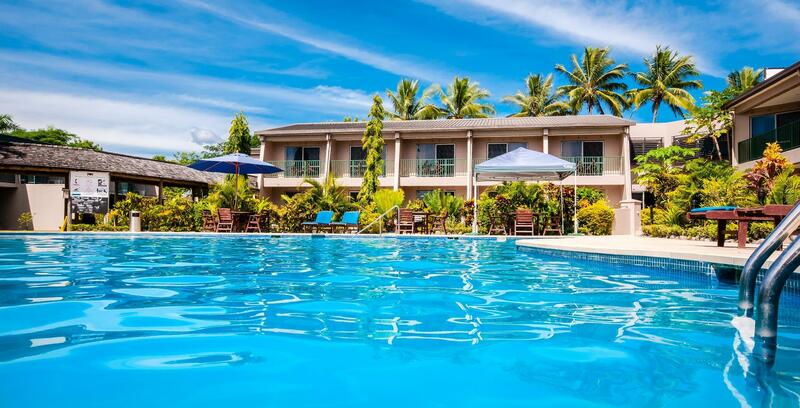 We stayed at this hotel one night before going to Yasawa groups by Tavewa Seabus. It takes 5 min drive to Lautoka wharf. Our room hadn’t been prepared at the check-in time. We have to wait at the lobby for 1 hour. The staff didn’t let us know when the room is prepared until we ask them. 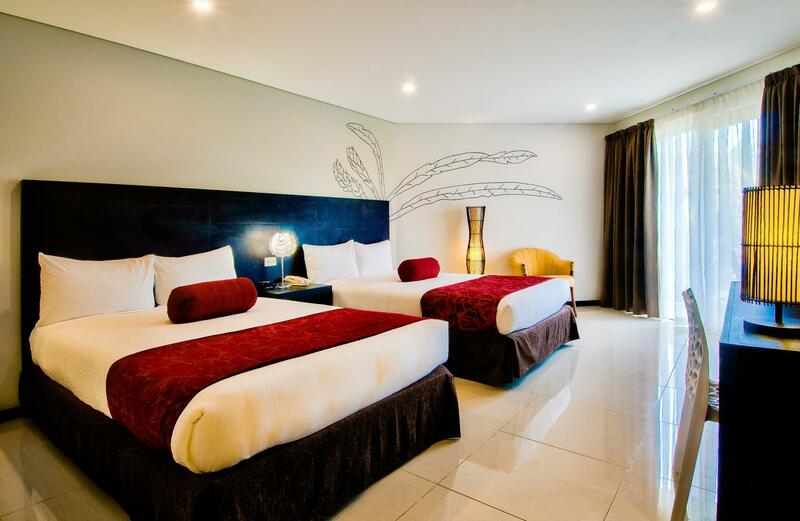 I think this hotel is clean and nice but too expensive because there are not so many hotel around Lautoka. I recommend to stay Nadi because you can choose from many hotels and it takes just 25 min drive from Nadi to Lautoka wharf.